"The beauty of tortoiseshell has been the hawksbill's curse," said the aquarium's assistant research scientist and first author Dr. Emily Miller. "The fact that the tortoiseshell trade patterns and the IUU fishing patterns overlap so strongly suggests that social and economic factors are driving them. These drivers are issues of governance and longstanding trade relationships that form complex and opaque trade networks." 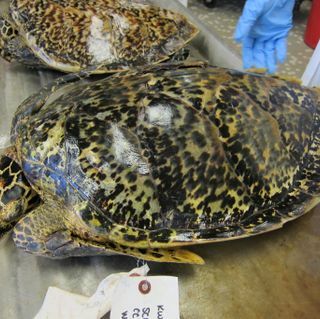 Senior author of the study, Dr. Kyle Van Houtan, director of science at Monterey Bay Aquarium, initiated the research to better understand how the tortoiseshell trade affected the global population of hawksbill sea turtles. Hawksbills are critically endangered throughout their range, largely from being killed for their ornate shells. The shells -- still trafficked illegally -- are used to produce the translucent, semi-precious material called tortoiseshell, which has been carved into items such as sunglasses, bracelets, guitar picks and combs. Previous historical estimates of the global tortoiseshell trade relied on data that only went back to 1950. Scientists knew that hawksbills have been exploited for centuries, but didn't have access to enough pre 1950 data to conduct a formal analysis. The aquarium team gathered archival import records from dozens of countries going back to 1844, over a century earlier. The newly accessed records revealed that over 538,000 kilograms (1,186,087 pounds) of tortoiseshell were traded before 1950. The authors estimate this volume of tortoiseshell translates to over 880,000 turtles killed, which were unrecorded in previous estimates. "It's rare to have 150 years of data for anything, particularly for a species that's critically endangered today," Miller said. "Our team spanned several continents and pored over published and unpublished historical archives of trade data. The team compiled all these records and painstakingly curated them to remove re-exports. Due to this enormous effort, we were able to see much further back in history." The team then had to find a way to convert the masses of scutes -- the traded portion of the turtle carapace -- listed in the records into the number of turtles that produced those scutes. This was essential, as tortoiseshell shipments of similar weights could be composed of a few large adults or many smaller juveniles. The difference between those two, however, is critical to understanding the population impact of the trade. Van Houtan solved the puzzle by comparing measurements of archived specimens and stranded hawksbills with a large shipment of scutes seized by U.S. law enforcement agents. This allowed the research team to determine how much tortoiseshell a turtle produces, as well as create models to estimate the total number of turtles killed over time. Their results indicate hawksbills were exploited on a scale far greater than anyone previously thought. Approximately nine million turtles were harvested for shells over 150 years across a geographic range that spans tropical Pacific, Atlantic and Indian Ocean waters. Averaged across the study period, the study derived an annual harvest total of about 60,000 turtles -- which is more than twice the current global population estimate for breeding females. Miller also used the archival records to identify the top tortoiseshell exporters, and found a strong correlation with modern IUU fishing patterns. Trade in Southeast Asia. Indonesia, Fiji and Thailand combined accounted for about half of the historical exports. The study suggests that the international tortoiseshell trade map of centuries past may have established the groundwork for modern IUU fishing patterns. "We know these IUU practices didn't just spring up overnight, but likely came from established networks and operators," Van Houtan said. "We might have, in these 150 years of tortoiseshell data, found the beginnings of the networks and operators of IUU fishing today." Identifying the link between long-established tortoiseshell trade routes and contemporary IUU fishing may have the potential to inform better monitoring of other illegal and illicit activity. "Human trafficking, narcotics trafficking, arms trafficking, wildlife trafficking -- studies show these are intertwined," Van Houtan said. "This is a complicated geopolitical problem. By working together across international boundaries, we can help narrow the problem and address these challenges."